ePublishing Knowledge BaseePublishing Knowledge BaseePublishing Knowledge Base Creating and Sending eNewslettersHow can I send a newsletter by copying and pasting to my Email Service Provider? There are many reasons why you may want or need to move a newsletter issue from your ePublishing admin tools and send it directly through your Email Service Provider's tools. Perhaps you don't have an API connection to the ESP you want to use or you are having problems sending out through the normal API integration. These steps will guide you through grabbing the newsletter issue HTML from the ePublishing admin tools and pasting it into your ESP's tools to manually send out the email. For this example, I am using Mailchimp but the steps are almost identical in all other ESPs. 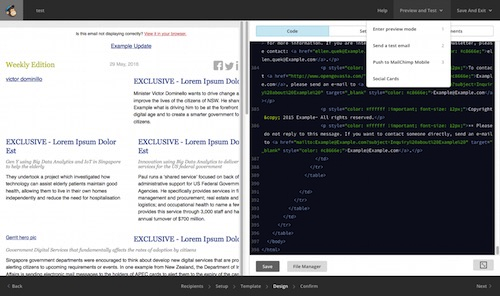 To start, go to the newsletter manager in your site's admin tools. Choose the issue you are ready to send out. In the content field you will probably already see the email's HTML. If you do not, click generate content then save. This is covered in more detail in the ePublishing Knowledge Base. Highlight and copy all of the code in the content window. Step 3: Go to your Email Service Provider Admin Tools. Next, go to your email service provider account and create your newsletter issue. For detailed instructions on how to create a new newsletter at your ESP, please check your ESP's documentation. Paste the copied HTML into the window provided in the ESP's admin tools. 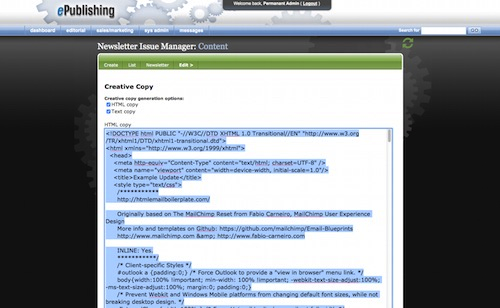 Test your newsletter issue using the tools provided at your ESP. Be sure to send yourself a test copy to make sure images and layout are still correct. Don't be alarmed if images are not displaying in the email when viewed at your ESP. Some ESPs, such as Mailchimp, don't always display remote images. Please verify that they are displaying when send yourself a test. If your tests look good, then send our your newsletter issue following the instructions provided by your ESP. Prev: How do I send a welcome email to new registrants? Next: How do I make my newsletters have different header images?